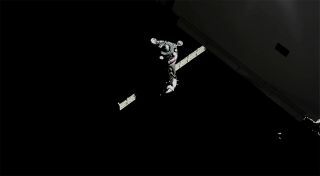 The Soyuz spacecraft carrying NASA astronauts Drew Feustel and Ricky Arnold and cosmonaut Oleg Artemyev approaches the International Space Station on March 23, 2018. Two U.S. astronauts and a Russian cosmonaut have arrived at the International Space Station (ISS) for a five-month stay. NASA astronauts Drew Feustel and Ricky Arnold, together with cosmonaut Oleg Artemyev of the Russian federal space agency Roscosmos, docked their Soyuz MS-08 spacecraft to the space station's Poisk module today (March 23) at 3:40 p.m. EDT (1940 GMT). The linkup came two days after the trio launched from Russia's Baikonur Cosmodrome in Kazakhstan. Russia’s Soyuz MS-08 spacecraft, with cosmonaut Oleg Artemyev and astronauts Drew Feustel and Ricky Arnold aboard, approaches a docking at the International Space Station on Friday, March 23, 2018. Another Russian spacecraft attached to the space station is seen in the foreground. The three newly arrived crewmates will serve as Expedition 55 flight engineers until early June, when command of the space station will pass to Feustel, and Shkaplerov, Tingle and Kanai will depart on Soyuz MS-07 for Earth. Three more crewmembers — Sergey Prokopyev of Roscosmos, NASA astronaut Serena Auñón-Chancellor and Alexander Gerst of the European Space Agency (ESA) — are scheduled to arrive the following week to join Expedition 56. The Expedition 55/56 crew will work on hundreds of experiments in biology, biotechnology, physical science and Earth science. They will also oversee the arrival and departure of uncrewed cargo spacecraft ferrying supplies and science equipment to and from the ground. But first, Feustel and Arnold are scheduled to go outside for a spacewalk on March 29. The extravehicular activity, or EVA, will install external wireless antennas to route data from exterior-mounted science experiments and retrieve jumper cables for the station's ammonia coolant system. The view and telemetry from Russia’s Soyuz MS-08 spacecraft with cosmonaut Oleg Artemyev and astronauts Drew Feustel and Ricky Arnold aboard as the two vehicles approached a docking. Feustel and Arnold will also replace cameras mounted on the exterior of the orbiting complex. "We are going to replace a camera group that gives us the wonderful views of the Earth and also helps us see what is going on around the space station," said Arnold at a pre-launch news conference on Tuesday (March 20). The spacewalk is one of four planned for Feustel, Arnold and Artemyev's stay, including two more EVAs by NASA astronauts and one by cosmonauts. In their free time, Artemyev and Feustel are planning to challenge their crewmates to a couple of different sports. Artemyev brought to the station a soccer ball that he and his crewmates will kick around before it goes on to join the 2018 FIFA World Cup taking place in Russia from June 14 through July 15. "We're bringing a [soccer] ball that is going to be thrown on the field during the very first match," said Artemyev before launching to the space station. "We're taking it to the ISS and Anton Shkaplerov will bring it down to Earth, and it will be used during the first match." Feustel worked with the U.S. Tennis Association's (USTA) Net Generation to arrange for some micro- racquets and tennis balls. "Tennis is one of my loves," he said in a NASA briefing. "Maybe we'll get to play some tennis in space." Beyond the games, Arnold intends to use his place aboard the station to reach out to students from around the world. A former middle school mathematics and science teacher, he is helping to lead NASA's Year of Education on Station, continuing the effort begun by a fellow educator-astronaut, Joe Acaba, during the previous expedition. "The space station is a world-class laboratory, and it is also a world-class facility for education in low- Earth orbit," Arnold said. Expedition 55/56 marks Arnold's and Artemyev's second spaceflights and Feustel's third. Arnold, 54, and Feustel, 52, each flew on space shuttle missions that visited and helped assemble the space station. Artemyev, 47, earlier served on the Expedition 39/40 crew as a flight engineer. Feustel, Arnold and Artemyev are scheduled to return to Earth on Soyuz MS-08 in August.